Finding the perfect backpack to use as a carry-on can prove to be a daunting task. Not only do you have to think about airline restrictions, but you also have to consider if a smaller bag is enough for you to travel with it. Therefore, we hope that you will find this Osprey Farpoint 40 Review useful. Osprey Farpoint 40 is a travel backpack for passengers who enjoy packing light and backpacking enthusiasts around the world. However, there are other benefits of this product. You can use it as a carry-on as well, and even for light hikes during the day. We wanted to help you learn about all the features this backpack has. In addition, we want you to know all the facts about it, as well as how it can help you learn to pack efficiently. When it comes to backpacks, you can rarely find a company that continues to enhance their designs every year. Because of that, it is wonderful to see that Osprey still offers premium products at a reasonable price. After carefully considering all opinions, Osprey came up with their Farpoint 40 backpack. This product is something many could benefit from - not just frequent travelers and adventures. One of the key advantages this backpack has is that it does not strain your back or cause you any harm. Even though it can weigh a lot, you will not feel the weight while you are walking or hiking. There are enough suspensions to increase the comfort so that you can carry it around without putting the pressure on your spine. Not many backpackers feel the strain right away. However, once you start going on longer hikes or travels, your back is almost certainly going to suffer. That is precisely what makes Osprey Farpoint 40 stand out. The main idea was to make it as comfortable as it could be. Hence, Osprey included the LightWire Frame suspension to give your back the much-needed support. The suspension transfers the heaviness to the hip belt which you wrap around yourself. It is a tiny addition, but undoubtedly one of the most significant ones. Furthermore, they designed the rucksack so that you can comfortably pack all the necessities your travels might require. As far as the carry-on option goes, the company carefully designed the product so that it could fit into the overhead compartment inside an airplane. The dimensions are what counts the most when it comes to flying all over the world - and Osprey Farpoint 40 is the perfect size for it. Nowadays, traveling light is a popular trend, and hassle-free packing is the primary purpose of this rucksack. 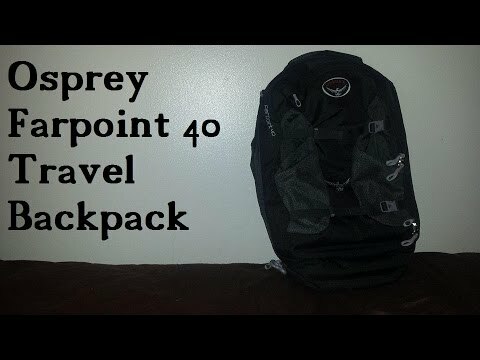 Osprey Farpoint 40 Travel Backpack Review - Airline Approved! In addition to that, it is fantastic to use for your daily hikes and walks. Among other things, it also allows you to have everything you need within a hand's reach. One of the most important features Osprey included in their design is the front opening. It allows the travelers to pack and unpack in the shortest amount of time possible. Furthermore, it is far easier to find something at the bottom of your bag if it opens like a suitcase. This is the perfect option for people who are always trying to pull out something from the bottom of their bag. Unlike other rucksacks, Osprey Farpoint 40 opens up like a suitcase. That allows you to pack your belongings without sacrificing much-needed space. Furthermore, this sort of opening is far more convenient and useful while you are traveling around the world. Always on the lookout for high-quality, Osprey included zippers that will surely withstand the pressure of time. In addition to that, you can also lock them up while you are walking or hiking so that nobody can open your rucksack from behind. The rucksack comes with pockets perfect for storing water bottles or any easily lost items. Unlike other backpacks, this model comes with a top and a side handle. While it may not seem useful at first, you will be pleased with this addition when you find yourself in a jam-packed airport. It allows you to easily carry the bag around without having to elbow your way through the crowd. In addition, the handles come with extra padding so that you do not hurt your hands while carrying the rucksack. You can pack up to 40 liters worth of necessities inside of this bag. That means that there is enough space for both clean and dirty clothes, and toiletries and gadgets as well. There are internal straps which allow you to secure your belongings in place. In addition, there are also exterior straps to make the bag even smaller. That is especially useful when traveling by plane, and if you tend to overpack. The inside straps will help the clothes and other items stay in place, while the outside ones will restrict the load even further. If you are already traveling light, there is no need to check in your luggage. That is why Osprey Farpoint 40 can easily squeeze in the overhead compartment in most airlines. However, just to be safe, you should check beforehand that you are not going over the indicated dimensions. If you feel like carrying the rucksack as a duffle bag instead, you can do that by attaching the removable shoulder strap. One of the most interesting parts of this model is the back panel flap. The idea is to help you hide the straps you are not using at that given moment. It is especially useful if you have to check in your rucksack. Once you hide the straps, you can rest assured knowing that they will not get caught on anything at the airport or during transport. Most travelers carry their laptop and other electronic devices with them. Because of that, the designers at Osprey added a convenient laptop compartment inside the bag. It fits most laptop sizes, and there is enough room so that you do not have to move other things to get to your gadget. It is a multifaceted product. Osprey Farpoint 40 gives you multiple uses and carrying options. The handles it comes with are high-quality and padded so that you do not hurt your palms while traveling with it. In addition to that, they also added a removable shoulder strap so that you could use it as a duffle bag as well. The back support is outstanding. Not only will the rucksack feel as light as air, but your back will not hurt afterward. The built of this product is the number one thing that justifies the price. By having the lightweight suspension frame transfer the bulk of the weight to the hip belt, the user does not feel discomfort even if he has walked all day long. There is enough space for essentials and clothes. Although it does depend on your packing style, the size of this model is convenient to pack enough clothes and toiletries for both shorter and longer trips. However, it would be safer to learn how to travel light so that you do not accidentally overpack and have to check in your bag. The design is not too complicated. Even though it boasts with many features, the overall appearance of this bag is minimalistic. Osprey decided against using a material that would draw too much attention. Furthermore, the back panel flap keeps the straps securely out of sight and helps the bag maintain a more simple exterior. Water bottles cannot fit inside the mesh pockets. If you overpack your backpack, you might not be able to put the water bottles in their rightful place. That is an important disadvantage if you are using this rucksack for hikes. However, you can always pack lighter and avoid this problem. There aren’t many exterior pockets. This might be something that could cause you trouble when you are out and about. Because everything is inside the two main compartments, you would have to stop and open the backpack in order to find something. The placement of the laptop compartment. Usually, the laptop should be near your spine because it is the heaviest item. However, in Osprey Farpoint 40, the designers have placed it on the outside. This is not a deal-breaker, but it is something that could be improved. Osprey Farpoint 40 Travel Backpack comes in three colors. You can choose between Caribbean Blue, Jasper Red, and Volcanic Gray. Which locks should I use in order to avoid being robbed while carrying the rucksack? Safety always comes first, and that is why you should place locks on your zippers. However, if you are using the rucksack for a daily walk, it might not be necessary. Still, longer travels where you are not going to check up on your bag frequently require proper locks. We recommend you to use TSA locks so that you do not have any trouble with airport security. Can this rucksack fit under an airplane seat? This depends on how much you pack inside. However, bear in mind that some seats do not have that much space beneath them. Even with the compression straps, your best option is to place it in the overhead compartment. How much can I pack inside? You can fit up to 40 liters worth of clothing and accessories in this rucksack. However, most users do not fill it to the brim because they usually do not need that much stuff. If you are a light packer, you will not have any trouble using this rucksack for your travels. However, if you tend to overpack, make sure you are doing so as neatly as possible. When it comes to size, Osprey made sure you have more than one option to choose from. The size guide is especially important if you are a tall individual or a petite adventurer. You can choose between two options: S/M and M/L. If you are not sure how to determine which size will fit you, there is an easy way to find out. If your height is lower than 5 ft 6 in, then you can choose the smaller model. However, if you are taller than that, then the medium model will be the best option for you. Overall, Osprey Farpoint 40 Travel Backpack is a product you should pay attention to. Not only does it have a variety of useful features, but it is also fantastic for almost all sorts of travels. You can use it comfortably for hiking, or just as a carry-on. Furthermore, it might be the best small travel backpack we have ever encountered. When it’s empty, it weighs only about three pounds. That means that the size of it allows you to pack more of your belongings. In addition, the clever design helps you stay comfortable during your travels. Travelers often come back from their adventures with a significant back strain. However, the frame suspension moves the bulk of the load to your hips, so that you do not feel any pressure or pain while wearing the rucksack. Hence, we would recommend this product for any traveler who wants to travel light without worrying whether or not the load will hurt his back. On a scale of 1 to 5, this is an outstanding 5 for us. We hope that this Osprey Farpoint 40 Review helped you get to know this model a bit more. Furthermore, we are sure that you will undoubtedly enjoy this backpack as much as you enjoy traveling the globe.